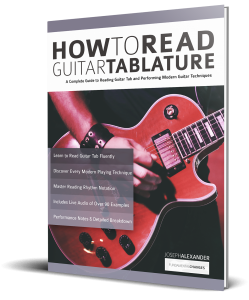 The basics of how to read guitar tablature are very simple. The tablature stave or staff contains six lines and each line represents one string of the guitar. The easiest way to tell which one is which is to remember that the lowest (bass) string of the guitar is the lowest written line of tab. If you lay the book flat on a table, the closest line to you is the closest string to you. The highest pitched string of the guitar (high E) is the highest line on the tab. On paper, it’s the furthest line away from you and also the furthest string away from you on the guitar. You can now easily see how the lines relate to the strings on the guitar. Often in guitar tab you will see the note names of the strings written to the left of the tab stave, and the word TAB written on the strings themselves. As with standard notation and written English, we read music from left to right. To indicate that a specific fret should be played on a particular string, we simply write the required fret number on the relevant line. Play the 3rd fret on the lowest (sixth) string. Play the 5th fret on the highest (first) string. Play the 2nd fret on the second (B) string. Play the 7th fret on the fourth (D) string. Play through the following example and listen to the audio track to check you’re doing it right. To indicate that a string should be played open without any fretted note, we simply write a 0 on the required string. If we need to play two or more notes at once, the fret numbers are stacked vertically on top of each other. Remember, we read from left to right, so notes that are written vertically are played simultaneously. Pick or strum the following example. In the previous example, you may have recognised the final chord of D Major. Normally, when a full chord is notated in tablature we add the chord grid and symbol above it to make the music easier to read. To test yourself, play the following melody on your guitar. Finally, it’s possible to play a note on the guitar which doesn’t have any pitch at all. This is called a mute and it’s normally performed in one of two ways. The first way is to gently press on the string with the fretting hand, making sure you don’t push the string all the way down to the fret. The second way is to mute the string as you play it with your fretting hand. When you pick a muted note it should sound dead and percussive. It definitely shouldn’t sustain. Single notes and whole chords can be muted. However you play it, a muted note is shown by an X on the string instead of a number. In the next lesson we’ll look at some more advanced guitar techniques and tablature symbols.